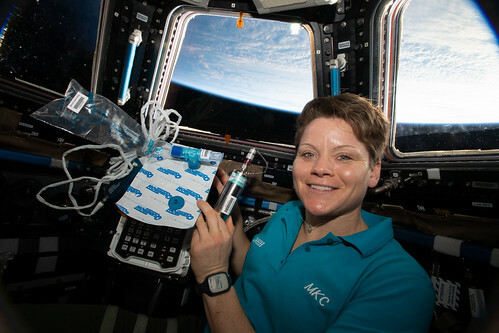 iss058e010750 (Feb. 6, 2019) --- Expedition 58 Flight Engineer Anne McClain of NASA is pictured in the cupola holding biomedical gear for the Marrow experiment. The study measures fat changes in the bone marrow before, and after exposure to microgravity. In addition, this investigation measures specific changes of red and white blood cell functions. Bone marrow fat is measured using magnetic resonance. Red blood cell function is measured with a breath sample analyzed with a gas chromatograph, and white blood cell function is studied through their genetic expression.